Busy Frugal Family: How to Survive Black Friday Without Destroying Your Budget or Your Bank Account! 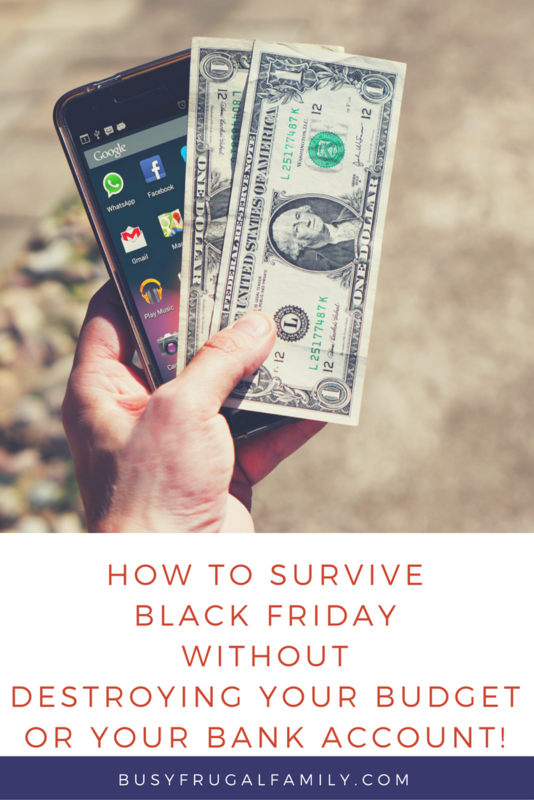 How to Survive Black Friday Without Destroying Your Budget or Your Bank Account! For many Americans, Black Friday has become a ritual and expectation. While we're not against Black Friday, the day can lead to buying things you don't need for more than you should pay. Here are some tips to help busy frugal families survive Black Friday without destroying your bank account or your budget. Set a Black Friday spending limit with your spouse. Whether you handle your finances jointly or separately, discussing your financial goals with your spouse and getting on the same page is critical for a healthy marriage. Come to an agreement on how much you will spend based on what you can afford. Ideally, you would have money saved up for this expense, but if you're not there yet, you can at least agree on how much money you both will spend. Think about what you want to buy before looking at the Black Friday ads. Deciding what you want by looking at the ads is like going grocery shopping when you're hungry. If you let the ads tell you what you should buy, you're more likely to overspend and buy things that seem cool but you don't really need or don't help you reach your goals. Free yourself from the pressure to buy something for everyone. Heartfelt gifts don't have to cost a lot of money. If you buy someone for every coworker or person you supervise, every family member, and all your friends, you'll be broke before you even get to Cyber Monday. They probably won't even remember the gift you gave them in a few weeks. If you take the time to compose a handwritten note or make something from materials you have at home, the gift will be distinguishable from all the other gifts people get during the holidays. If you're a person of faith, remember that Christmas isn't about presents in boxes. It's about the greatest gift we could ever receive. Don't forget about any unused reward points, reward miles, or coupon app earnings. One way to reduce your out of pocket costs for the holidays is to use accumulated reward points or miles. If you plan to travel during the holidays, you may be able to use your points for hotel stays and transportation and use your miles for plane tickets. If you use Coupon apps like iBotta or Checkout51 and have accumulated enough money to cash out your savings, you may have enough extra money to drastically reduce the amount of money you need to contribute for holiday purchases. Have another tip for saving money on Black Friday? Let us know in the comments! Preparing the Next Generation of Familypreneurs!